The global market for ultra-low alpha market is anticipated to rise at a healthy rate in the coming years, as reported by Transparency Market Research (TMR). The market’s vendor landscape comprises of prominent names, with a moderate competition between the vendors. Companies are focusing on broadening their product portfolios in order to sustain alongside the market giants present in the industry. Several manufacturers are involved with the production of products customized for the aviation and the automotive sector, in order to tap into the potential opportunities offered by these industries. Key players in the global ultra-low alpha metals market are Honeywell International Inc., Alpha Assembly Solutions, Mitsubishi Materials Corporation, Pure Technologies, and Tech Resources Limited, among others. According to TMR, the global ultra-low alpha metal market is prognosticated to rise at a 7.4% CAGR over the forecast period of 2017 to 2025. In 2017, the opportunity in this market stood at US$2.7 bn and over the course of the forecast duration, is predicted to reach US$4.9 bn. Based on end-user, the segment of zero-defect wave soldering is expected to gain traction in the forthcoming years. This application requires a consistent solder quality, which is a primary factor boosting the demand from this end-use segment. Geographically, while developed regions are expected to demonstrate considerable traction in the market due to strict regulation regarding hazardous substance use, emerging regions such as Asia Pacific is predicted to hold the place for contributing a high revenue in the global ultra-low alpha metal market. The emergence of this region could be ascribed to the surge in number of manufacturing sites, and easy availability of raw materials. The Asia Pacific market for ultra-low alpha metal market is forecasted to exhibit a 7.3% CAGR over the forecast period. In the flip chip technology domain, ultra-low alpha metal is chiefly used in soldering fabrication: for instance, solder microspheres and copper pillar solder caps are required in advanced flip chip and 3D wafer-level chip packages. Moreover, it could be used in circuit boards, semiconductor packaging, printed circuit boards (PCBs), bumping, and plating. These components are employed in a number of industries such as telecommunication, automotive, aviation, medical, and electronics. The market is witnessing a rapid demand due to regulations made by Restriction on Hazardous Substance Directive (RoHS) that prohibits the use of hazardous materials in electric and electronic units. Subsequently, the low emission rate (<0.002 cph/cm2) of ultra-low alpha metal than other hazardous materials in electric and electronic units is accelerating the market growth over the forecast period. Expansion of electrics and electronic sector in emerging regions, especially in countries such as China, Japan, and India. This can be attributed to rapid industrialization and increasing urbanization during the past few years. The markets in various other developing economies such as Brazil, Russia, Korea, and India among others are also expected to witness a rapid growth throughout the forecast period. 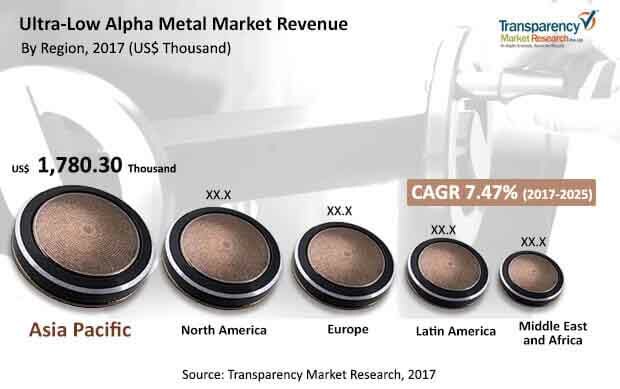 In addition to this, rising per capita disposable income and surge in the global economy is another key factor which is expected to bring impetus to the growth of the global ultra-low alpha metal market during the forecast period.